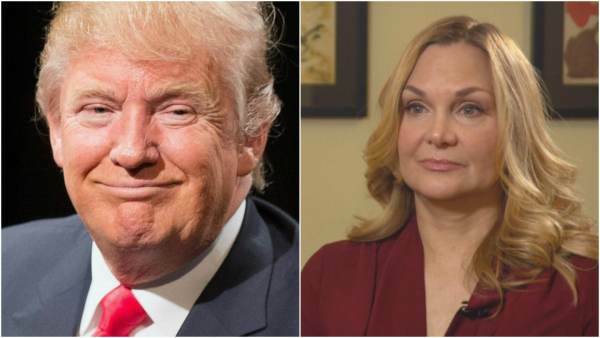 The Hill‘s John Solomon reports Jill Harth begged Donald Trump to be his makeup artist before her sexual assault allegations against the candidate resurfaced during the 2016 presidential election. A New York cosmetics executive who publicly alleged Donald Trump sexually assaulted her in the 1990s repeatedly solicited the future president to become his campaign makeup artist and to pitch her new product line in the months before her story roiled the 2016 race, according to the woman and her contemporaneous emails. “Hi Donald, you are doing a tremendous job of shaking things up in the United States. I am definitely on Team Trump as so many others are,” Jill Harth wrote the future president in an Oct. 1, 2015, email sent to him through his New York company’s headquarters. “I can’t watch television without seeing you or hearing your name everywhere! It’s a good thing for sure but PLEASE let me do your makeup for a television interview, a debate, a photo session, anything!” Harth wrote. “It kills me to see you looking too orange and with white circles under the eyes. I will get your skin looking smoother and even toned,” she added, boasting she would “sculpt your face” to look good on high-definition television sets. “I also want to put it out there that I would be willing to say at a rally or somewhere how [Trump] helped me with my self-confidence and all positive things about how he is with women to counter any potential negativity that may come out at some point in the campaign,” Harth wrote to Trump’s business assistant Rhona Graff. “The connection between Harth’s business interests and her accusations have been intertwined for the past two years. Harth said she asked prominent lawyer Bloom to represent her after media attention to her sexual assault allegations began hurting her business in fall 2016,” reports Solomon. Bloom even launched a GoFundMe to help pay for Harth’s expenses. Last week, Solomon reported on a ‘prominent’ attorney seeking ‘donor cash,’ for women willing to come forward accusing President Trump of sexual harassment. The attorney is none other than Lisa Bloom, who recently came under fire for advising sexual predator Harvey Weinstein. Bloom admitted to The Hill that she sought funds from Trump accusers prior to the election. “Donors reached out to my firm directly to help some of the women I represented,” said Bloom. “Our standard pro bono agreement for legal services provides that if a media entity offers to compensate a client for sharing his or her story we receive a percentage of those fees. This rarely happens. But, on occasion, a case generates media interest and sometimes (not always) a client may receive an appearance fee,” added Bloom. Bloom is the daughter of disgraced lawyer Gloria Allred, whose client Beverly Nelson was caught forging a portion of Judge Roy Moore’s alleged signature inside her yearbook. Earlier this year Bloom represented failed comedian Kathy Griffin. Griffin tried to defend herself for holding a fake head that looked like President Trump with blood all over it. After being called out for being violent and gross and not funny, Griffin hired Bloom and held a press conference.